Who said Black Friday had to be about shopping? Black Friday is getting a makeover, with retailers like REI keeping their doors closed and some State Parks encouraging people to get out into nature and enjoy one another’s company. So give thanks, kick your feet up, and hang out with your family, dagnabbit. Yo! I understand, some people need a cocktail to enjoy their family… and I’m here for you. Here are some fun Black Cocktails to enjoy on Black Friday. I met up with Josh Suchan of Los Balcones in Los Angeles to show you how to make a smoky black cocktail to take the edge off the holidays. I put together a collection of dark as night cocktails to delight your guests, or just get you through the holidays. Featuring amaros, smoky mezcals, or captivating ingredients like squid ink & activated charcoal, these drinks originally ran in Chilled Magazine as Halloween Cocktails for Wicked Holiday Entertaining, but I’m not above recycling. It’s good for the environment, right? 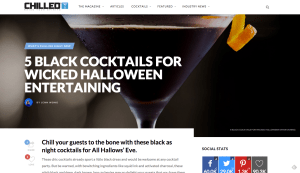 Find the recipes at Chilled Magazine– 5 Black Cocktails for Halloween, Black Friday, or pretty much anytime you need some mystery in your life. For those of you in Los Angeles – here are 3 drinks that you can try in our backyard.